Soak dried peas whole night. Presser cook with 3 cup of water for 8 to 10 whistle or till done. Heat oil in kadai, add cumin seeds, hing,dried red chilly, chopped onion and saute. Add ginger paste, garlic paste and saute. Add boiled dried peas with water. Add salt, red chilly powder, coriander powder, cumin powder, garam masala, tamarind pulp mix well. boil for 8 to 10 minutes or till semi thick consistency. Take serving bowl, pour usal, sprinkle onion, sev, coriander leaves. 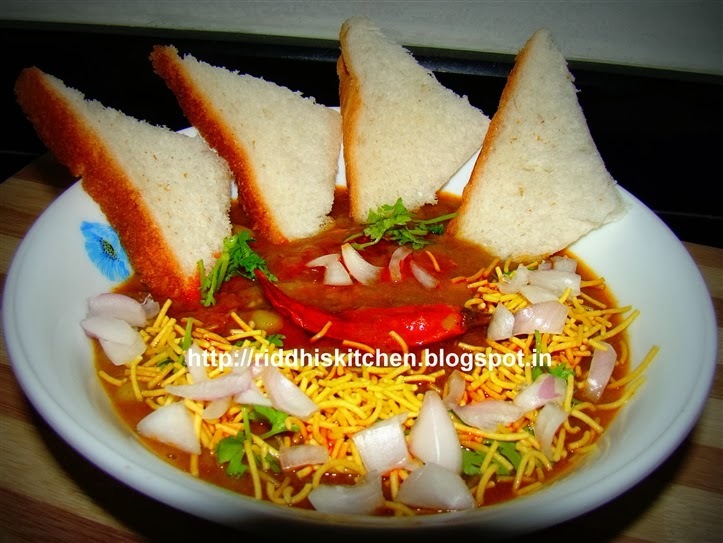 Serve with Bread or pav.